I had purchased 3d Coat V2, but honestly did not have time to start working seriousely with it. I followed a few tests but did not go much further. 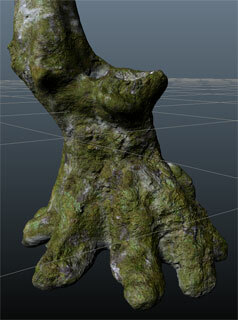 3d Coat was, however, more accessible than ZBrush to me and when V3 was finalized, I purchased the upgrade. I have barely started to work with it, and my tries look ridiculous compared to the works of more serious artists, but I am already having fun with it. To the right is an old beech trunk I am designing for an upcoming scene. Voxel sculpting looks complicated at first, but its most basic practice is deceiptively simple. I modelled the base trunk shape with traditional methods in Hexaon, then imported it in 3D Coat and reworked it until I got the right shape. I then painted bark and moss on it directly. Here is a small presentation of Voxel sculpting. 3d Coat is available as a 30 days free trial. The full professional licence costs $200. 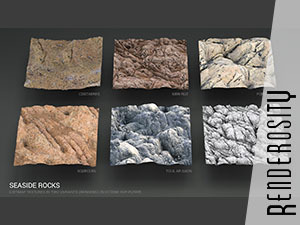 More information is available on the 3d Coat website.